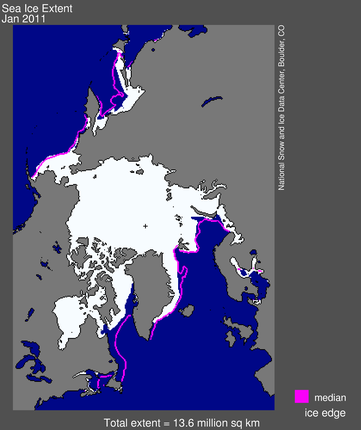 Arctic sea ice at record low… affecting NA weather? Arctic Oscillation brings record low January extent, unusual mid-latitude weather Full analysis here. It was 50,000 square kilometers [Vancouver Island is 31,000sqkm] below the record low of 13.60 million square kilometers, set in 2006, and 1.27 million square kilometers below the 1979 to 2000 average [over half the area of Greenland]. Air temperatures over much of the Arctic were 2 to 6 degrees Celsius above normal in January. Over the eastern Canadian Arctic Archipelago, Baffin Bay/Davis Strait and Labrador Sea, temperatures were at least 6 degrees Celsius higher than average. Temperatures were near average over the western Canadian Arctic Archipelago and Scandinavia. As in December 2010, the warm temperatures in January came from two sources: unfrozen areas of the ocean continued to release heat to the atmosphere, and the wind patterns accompanying the negative phase of the Arctic oscillation brought warm air into the Arctic. Near the end of January the negative Arctic oscillation pattern broke down and turned positive, which usually favors ice growth. It is unclear how long it will remain in a positive mode. Warm conditions in the Arctic and cold conditions in northern Europe and the U.S. are linked to the strong negative mode of the Arctic oscillation. Cold air is denser than warmer air, so it sits closer to the surface. Around the North Pole, this dense cold air causes a circular wind pattern called the polar vortex , which helps keep cold air trapped near the poles. When sea ice has not formed during autumn and winter, heat from the ocean escapes and warms the atmosphere. This may weaken the polar vortex and allow air to spill out of the Arctic and into mid-latitude regions in some years, bringing potentially cold winter weather to lower latitudes. Some scientists have speculated that more frequent episodes of a negative Arctic Oscillation, and the stormy winters that result, are linked to the loss of sea ice in the Arctic. Dr. James Overland of NOAA Pacific Marine Environmental Laboratory (PMEL) recently noted a link between low sea ice and a weak polar vortex in 2005, 2008, and the past two winters, all years with very low September sea ice extent. More research on these ideas may shed light on the connections and have the potential to improve seasonal weather forecasting. Next Snow on the Snowdrops? I’ll spice it up for ya.. Mike in Ukee says they are getting hit with some ripper sheet lightning at his place.. lighting up the neighbour really good. Cool.. looks like a big chunk of it on the map. It;s been thundering and lightening here since about 2am……………….wooooohoooo a little excitement! Apparently the 4am event this morning was quite wide spread.. heard from a number of difference sources over various locations that it was over the whole middle section of the island. Yes, those lightning storms were sites to behold. Friends on Facebook were saying it’s the worst they’ve seen on the coast. I beg to differ – I’ve seen worse. But it was fun at 4am watching the lightning. Or being blinded by it.